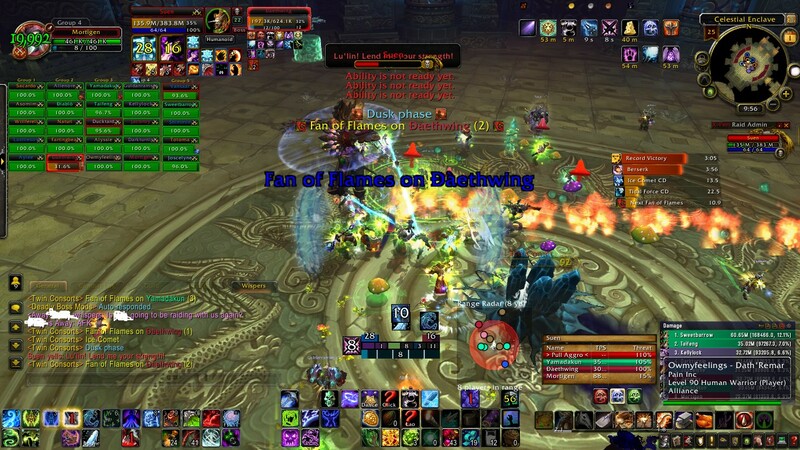 This entry was posted in Warcraft and tagged busy, lfr, overload, screenshot, UI by Typhoonandrew. Bookmark the permalink. The spell affects in 25-man are kinda fun until you are trying to down a boss in progression. I am having a hell of a time staying out of sand traps on Horridon normal. Standing in bad is something I don’t usually have an issue with… but how do you stay out of bad if you can’t see it? Some Blizz dev tweeted not too long ago that all the cool-looking spells prob need to be toned down a bit…. I’ve turned down my UI detail and the depth, which makes the game renders bit better, but also gets me standing in bad more often as it is harder to see. Kind of a Catch-22, fast system speed and FPS is needed to know the effect is there, but with lower graphica performance you cant see it anyway.